I wanted to paint the “magic hour,” which is that window of time just as the sun sets or before it rises. It is also known as golden hour because the sun is low or just below the horizon and the reddish, indirect light makes everything seem more vibrant. Photographers, cinematographers, and painters all love capturing the world when it seems flawless, shadowless, and still lit up as bright as day. 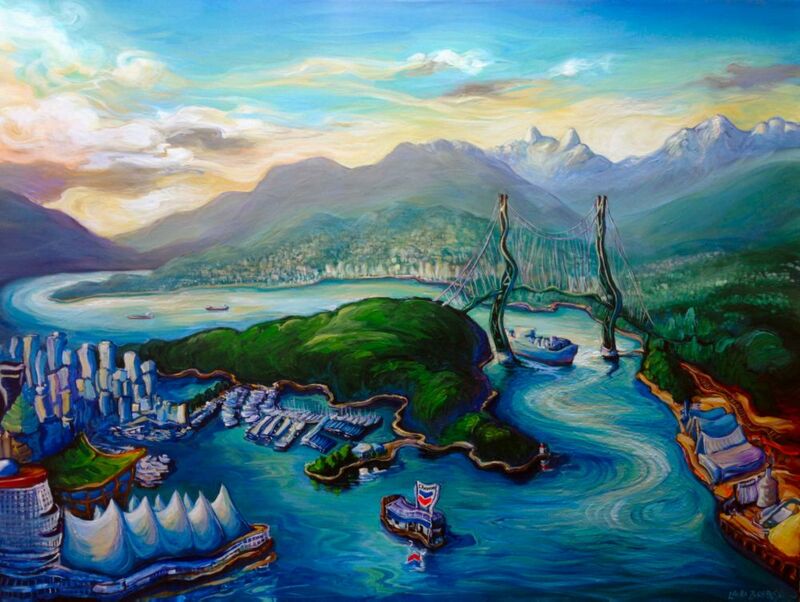 This scene features Vancouver’s Coal Harbour with West Vancouver as a backdrop. I made the sky full of feathery golden clouds and backlit orange fluorescence above van Gogh swirls in electric blue water. The path through the painting follows Burrard Inlet winding westward from busy hyperactive swirls to soft blends. At Magic Hour, the world is simultaneously calm and vibrant. It marks the transition of a busy day to a calmer night – or a busy night to a calmer day. Can this picture still be purchased and if so, what is the price. We are coming to Vancouver in June and would love to see what Vancouver paintings you have available. Thanks so much for your comment. Alas, this one is sold. here is my price list.